Relationships are a beautiful thing. When you are surrounded by people who love and care about you, everything seems brighter. But when relationships are strained, there is a heavy burden that weighs you down and darkens everything around you. Sometimes there is suffering in relationships. It might be for a season, or it might be something that doesn’t change. In my experience, suffering in relationships is one of the worst trials a person could go through. When I have relationships that are strained it breaks my heart. Sometimes we don’t know why these things happen, why people are in our lives for a season and then gone again. Other times, we can look back and see God’s hand at work even in the midst of the suffering. We can see the hand of God at work in Joseph’s story. But before we get into that, let’s look at this powerful verse in Romans 8:28. “And we know that God causes everything to work together for the good of those who love God and and are called according to His purposes for them.” This sounds like such a wonderful verse. All things will work together for good! But sometimes, we can misconstrue this verse to make it seem like everything will be perfect. This verse doesn’t really say that, does it? When I read this verse for the first time, I naively thought perhaps this meant that everything would be hunky dory. Instead, I can clearly see through a different lens that life has shown me differently what this verse really means. It doesn’t promise for our lives to be filled with amazing things because God loves us and wants us to have a great life. Instead, it means that through trials and fire God will refine us to be perfect so that we can live a purposeful life through Him. Now, let’s see what that looked like for Joseph. When we allow the seeds of anger and hatred in our hearts to grow, they do not produce a good harvest. And Joseph didn’t make things better when he shared with his brothers a dream he had had where they were gathering grain and suddenly the bundled grain stood up and all of their grain bundles bowed down to his grain bundles. Talk about adding fuel to their raging angry fire. So you can imagine how these brothers must have felt when they were out working in their fields for their father and they see their brother coming to greet them wearing his fancy coat. They were bitter. They were angry. And they were about to come face to face with their emotions in a huge way. Joseph had been asked by Jacob to go and find out how his brothers were doing tending the sheep out in the pastures of Shechem. He was to come and report back to Jacob after he had met with his brothers. But his brothers had other plans for this beloved son. They decided to kill him, this dreamer that made their lives so miserable. But then, there was this one brother, Reuben, who didn’t want to see Joseph die. It doesn’t tell us why, because all the brothers hated Joseph. Perhaps God was using Reuben to help carry out his plan for Joseph. Because Reuben convinced his brothers to not kill Joseph, but to just throw him in a well where he would die of natural causes. (Although we know Reuben was actually planning on coming back for Joseph later). When Joseph arrived, that is what they did. But his story doesn’t stop there. He doesn’t die in that well. His brothers see some slave traders coming and decide they can get rid of Joseph once and for all by selling him. And that is exactly what they do. Have you ever wondered how Joseph felt during all of this? In obedience to his father, he sets out to find his brothers. Instead of meeting up with them to get a report on their shepherding, his special coat is ripped off of him and he is thrown into an empty well. I wonder how he must have felt as he lay in the bottom of the well. He must have been hurt from the fall. He might have cried from pain and also from the actions of his brothers. We don’t know for sure. But if we can just imagine, it must have been hard for him. Then his brothers get him out of the well and SOLD HIM. How heavy his heart must have been as he wandered off into the wilderness, once a free man part of a wealthy family, now a slave. A piece of property. He no longer had a place. He was rejected. He was seemingly worthless. His heart must have been broken. The uncertainties of what was to come must have been terrifying. Interestingly enough, we read that Reuben returned to rescue Joseph from the well only to find that he was no longer there. He tore his clothes as a sign of grief. Maybe he was afraid to face Jacob. When he confronted this brothers and asked about it, they ripped up the colourful coat and dipped in animal’s blood so they had something to send back to Jacob. They knew he wouldn’t ask questions when this beautiful coat was in a state of disrepair. Jacob grieved the loss of his precious son, believing he had been attacked and killed by an animal on his way to find his brothers. But the story doesn’t end there. 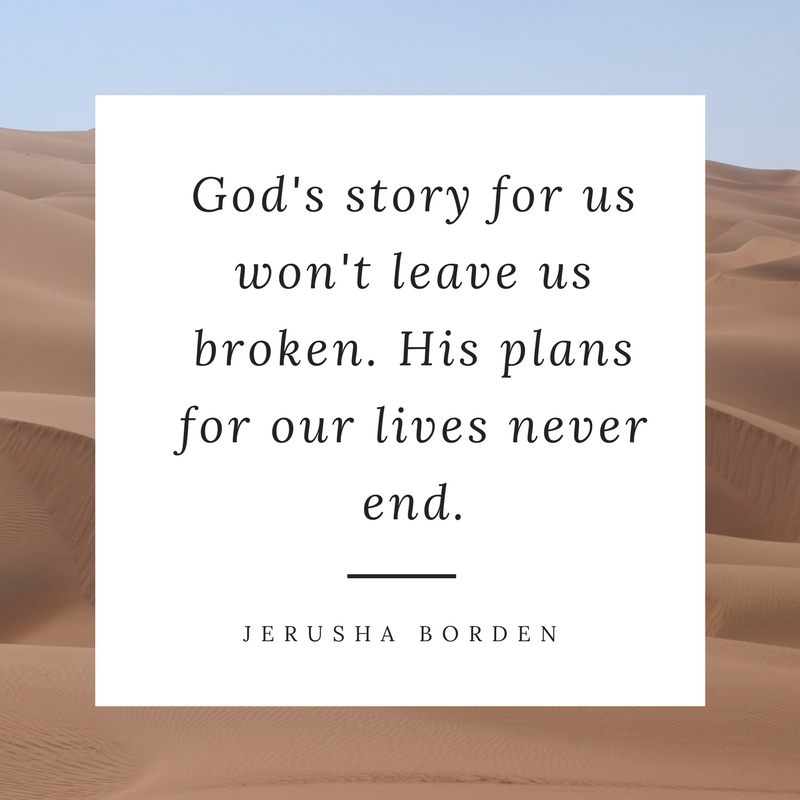 Because God’s story for us won’t leave us broken. His plans for our lives never end. It was the same for Joseph. At this point in the story, it is not easy to see how God is working this together for good. But it does. Joseph continues on the Egypt, where he is sold to Potiphar who worked for the king of Egypt. His story picks up in Genesis 39. My favourite verse is 2, “the Lord was with Joseph, so he succeeded in everything he did as he served in the home of his Egyptian master.” Did you catch that? Don’t miss this – the Lord was with Joseph. He was in a strange land, stripped of his privileges. He was away from his family and the father who loved him. But he was not alone. God was with him, in the midst of his suffering. Not only was the Lord with Joseph, but he allowed Jospeh to succeed in everything he did – something that did not escape the notice of Potiphar. He gave Joseph extra privileges, and Joseph did not disappoint him. Eventually, Joseph had full rule and reign over all the goings on in Potiphar’s house – so much so, that Potiphar never had to worry because Joseph was handling everything. Here we see that Joseph was in a period of blessing. Things were going well for him. But just like any of our lives, we have seasons. And Joseph’s season of blessing came to an abrupt end when Potiphar’s wife noticed the handsome man that was running the household. She pressured him day after day to sleep with her, but Joseph refused and tried to stay out of her way as much as he could. Until one day, she tried to force him and when he refused and ran away, she lied to her husband saying he was the one trying to force himself on her. Potiphar puts Joseph in prison. So here Joseph is again, wrongfully accused and sitting in prison. Not just any prison, but the prison where the king’s prisoners were held. So he sat there, in what was probably a terrible and filthy prison. Not at all like the prisons we have today. My heart aches for Joseph, who had done nothing wrong but was thrown away yet again. When we go through trials where we feel wrongfully accused, we often look for justice. Sometimes we question God. We think if God really cared for us, He wouldn’t allow for things like this to happen. But here is the beautiful truth for Joseph, and for us as well. Guess where He was in the midst of this? Verse 21 says, “but the Lord was with Joseph in the prison and showed him His faithful love. And the Lord made Joseph a favourite with the prison warden.” Again the Lord was with him. Rejected, but not abandoned by God. And here God works again in Joseph’s life. At this time, it was probably hard for Joseph to see what God was doing. But the second part of that verse gives us a hint – the prison warden liked Joseph. And just like Potiphar, eventually the prison warden put Joseph in charge of the prison and all the prisoners. Like Potiphar, he didn’t have to worry because Joseph was handling it for him. But God doesn’t leave Joseph in that prison. While Joseph is in charge of the prisoners, Pharaoh the Egyptian king is offended by his chief baker and his chief cup barer. We don’t really know what they did, but it was bad enough for Pharaoh to decide to throw them in jail. While they are in there, they have strange dreams and are upset. Joseph notices this and asks them to tell them about their dreams. God helps him to interpret their dreams and his interpretation becomes prophecy. What he said comes to pass. But he also asked that Pharaoh be told his story so that he wouldn’t have to be in prison for something he hadn’t done. And guess what? Forgotten again. It doesn’t happen. Again, Joseph must have wondered what God’s plan was in all of this. For two more years, he sat in jail. For two more years, he was forgotten. Until Pharaoh had a strange dream and the chief cup barer remembers the man in jail who had interpreted his dream. So Joseph is given an audience with the king. God allows him to translate Pharaoh’s dreams and warn him of hard times that will be coming. Pharaoh is pleased and honours him by making him head of all of Egypt, changing his name, giving him a wife, and changing his life completely. A season of blessing had arrived for Joseph once again. But this isn’t the end of the story. Joseph had interpreted Pharaoh’s dream and warned him that a famine was coming. God allowed them to prepare for the famine. They had some wonderful years with overflowing harvests and were able to store food for those years when the famine would be raging through their lands. Because of this, Joseph faced his past. And God was with him, even then. Have you ever had a bad experience in the past that rears it’s ugly head in your present? Maybe someone who had hurt you comes back into your life. I have been there before, and it is not easy to face them. As I mentioned before, strained relationships can be extremely painful. Forgiveness does not come naturally. And here Joseph, the second in command to Pharaoh meets his brothers once again. There was no food in their land, so they had travelled to Egypt in hopes of getting some food so they would not die. And who was in charge of the food? Joseph. I find this so interesting. The brothers don’t recognize Joseph, but he recognizes them. They had no idea what happened to their brother after they sold him into slavery. But he was just that, a slave. Slaves don’t rule Egypt. How could they know their brother was the one standing before them? But even more amazing is how Joseph deals with it all. He throws them in prison. I will admit, this part makes me smile – they kind of deserve it, right? But he lets all but one go, with food, and asks them to return with their younger brother – one Joseph has never met. And then he returns their money! The brothers are terrified of what will happen to them. They return to Jacob and tell him all that has happened. He is devestated and refuses to allow them to take his son Benjamin. But then things get worse and they run out of food, so he changes his mind. He makes the brothers take back double the money that was returned to them, as well as other gifts. When they return to Egypt, they are taken right into the house of Joseph. At this point, they were shaking in their sandals. What was going on? They were sure they were doomed and tried to pay the money back that was returned to them. Instead of being punished, their brother who had been in prison was returned to them. When Joseph arrives, he is filled with emotion at the sight of his younger brother and has to leave again. When he returns, he eats with them at his own table, a place of privilege. Joseph loves on his brothers with a love they don’t deserve. Does that sound familiar? Kind of like how Christ loves on you and me with a love we don’t deserve. The last thing these brothers deserved was to be treated like royalty. But the story doesn’t end there. He sends them off with more food, but he also devises a plan to make it look like they stole from him. When they are forced to return back to them, the brothers plead for the life of their younger brother Benjamin, who has made to look like he was the thief. Joseph allows for him to live and because he can’t stand it any longer, he tells them who he really is, weeping so loud that everyone outside his house can hear. Eventually Jacob is brought back to Egypt, and Pharaoh who heard the entire story, invites all of them to stay and have the best of his land. In what could only be a series of God ordained events, everyone is redeemed in this story. Even though these words are recorded in the Bible long after the life of Joseph, we can see how they reflect in his story. Because God was there. He has always been there. His power has always been there. His guiding hand has always been there. He didn’t abandon Joseph in his time of suffering and He will not abandon us in ours. We can take comfort in knowing God is with us, like he was with Joseph. He has a plan for our lives that we might not understand. But as Romans claims, He does work everything together for good. Even if it might not seem good to us. His ways are higher than our ways. His plans are better than our plans. And He has everything in His control, even in times of suffering.